I sang the National Anthem frequently around town while growing up. I sang a lot, and this was by far the most intimidating song in my repertoire. Everyone knows it. My vocal teachers would debate me on this next comment, but you can kind of fudge the lyrics if they are in, say, Latin or German, but you cannot fudge the lyrics to the National Anthem. They are magnificent. The end of the sung verse is my favorite; such power. I was asked to sing it before a basketball game at my high school. It was thrilling and terribly nerve wracking. I started fine, but soon forgot the words. I pulled out my pitch pipe, reset my nerves and started again. I forgot the words in the SAME spot. I stood in the middle of the basketball court, frozen. I truly had no idea what to do. A kind human in the stands started singing and many people joined her. They bailed me out. It put me back on track and I finished it. I left the court as quickly as possible and sobbed downstairs for the first part of the game. I knew that the longer I hid, the worse it would be, so I put my game face on and went back to the game and cheered along with my friends. There were MANY jokes the following week, but that was to be expected. It was just part of life and I moved on easily. I have been thinking so much about this great country lately. I love the pledge of allegiance. I cry almost every time the National Anthem is played at my beloved gymnastics meets. Participating in a USA chant for an Olympic trial was one of the most thrilling moments of my life. It hurts my soul to see how splintered our country is right now. The blatant racism, the lack of help in areas that need it after natural disasters, different groups separating in cries of injustice and how divided we all are over what is right and wrong. There is so much anger and hurt. I have been trying to sort out what I believe. I, too, have been angry. I have been angry that subsidies for some are so high, yet my family pays an enormous fee for ok health coverage. I have been angry that taxes are high and spent on programs I don’t agree with. I have been angry over this. I have been angry over that. Things have felt unfair toward ME and MY family when we have worked so hard to have a good life within our means. It has eaten at me. I value kindness toward others as the highest priority, yet deep down, I haven’t always felt kindness toward others. I have been too busy being angry and feeling self-righteous over how we take care of ourselves while others didn’t. I have been preaching one thing to my children, but feeling something else inside. Then, while running, I started thinking about what needed to be done. I am not so presumptuous to believe I can fix things I know little of, but I wanted to think about what I believed. Forgiveness and letting go of what has been done in the past was the only thing I could come up with, but it has stuck with me and I have been thinking about it continuously. Apologize for the wrong, and give forgiveness and acceptance to others no matter where they are in their journey. It needs to start with the people who have the most, who have emotional bank accounts that are full. It needs to start with people who have what they need in life. It needs to start with me. I grew up surrounded by models of success, and more importantly, models of extreme work ethic. I grew up supported by 2 parents who loved and believed in me unconditionally. I grew up with hope for the future as part of my life. I believed I could do anything I wanted. I never had to worry about a basic need and I never once worried that my parents would be anything but my loving parents, together, for me. I received a parental bailout when I needed one and they threw me in the air to fly when they knew I was ready. Because of that, in my case, there was no way I was going to fail if I gave it my all. I fell many times, but my confidence from my upbringing pulled me back to my feet. Who would I be without it? What if I had grown up without seeing happiness and success in front of me? Who would I be if I never felt safe at home? What if my parents thought I wasn’t enough just in being me? What about those who were told over and over that life isn’t good or that there was no point in trying because you were going to fail? How can I expect them to give up their hurt before I give up my frustration? I need to be the one who extends the first hand. I need to say hello and ask how you are, first. I can only imagine the nerves it took for that wonderful woman to start singing from the stands. I have sung in public forever, and that idea scares me. But she did it. In doing so, other people sang with her and lifted me up when I needed it. She didn’t know me, but she wanted to help me. It was the National Anthem. We all know it. She knew how to help and did it. I promise to return the favor. I am working on letting go of my anger over political fairness. I may agree or disagree, but I am not going to be angry anymore. I am going to be more interested in being a fellow human who says hello and focus on our shared humanity, flawed and beautiful. Does time sneak away from you? This post has been on my mind for over a YEAR. How does that happen? I can give a million reasons all relating to one giant belly, I mean event, but shame on me for not sharing something of such great importance. I attended a reunion last year, and in preparation for seeing certain people only once every 10 years, I set goals for myself. Obviously to look as thin, tan and visually put together were goals, but I had a more subtle goal as well. I decided that I would be an avid listener and speak with poise. You know ‘those people’ who always make you feel good and say exactly the right thing? I wanted to be one of them. I promised I would not tell embarrassing stories about my husband or myself (I tend to not have an uncomfortable-for-other-people filter), I would only pepper a bad word in when it was ironic or endearing and I would focus on the feminine and ladylike aspect of my personality. Cue the first night and a very fun informal party….I found myself in the middle of two men who were once truly adorable high school boys, discussing armpit odor. I volunteered my own concern of smelling bad. Seriously, Katie??? I had run a million miles, paid too much money for a fake tan and I discuss body odor at the first opportunity—with enthusiasm I might add. There goes the feminine. Despite my complete lack of the feminine mystique, I will share my most important non stink helper I have gathered, EVER. I have tried every deodorant and have stolen my dad’s French spray deodorant, but at some point they have all disappointed me. The natural deodorants do not work and make me think of scratchy fabrics and patchouli. No offense if you like either of those, but those are visions of hell for me; just like a stinky body. I stumbled upon an article that talked about the anti-stink properties of a lemon. A. Simple. Lemon. I am at home with a toddler who thinks I am perfect no matter what, so I thought I would try it out. It is brilliant. It is simple. It is a 36 hour smell repellent. A few juicy swipes of a lemon slice is the best damn deodorant I have ever used. (Perfectly peppered bad word, no?) Try it. Just do not try it right after shaving. Find me at the next ladylike event and I will tell you why in great detail. Years ago, I took a brief detour away from beloved Karen Kane for a job that turned out to be nothing short of misery. My core beliefs clashed with office policies and I could not adapt to certain things that made me uncomfortable. It grew to the point of me being incapable to make a decision. I am not kidding when I say that my refuge, aside from my husband, was television. In particular, Beverly Hills 90210 reruns. Television gets a bad rap. There are articles written about how it rots brains, etc. Have you ever thought that if you saw a live, staged episode of your favorite tv show, it would be called a play? Munch on that one for a moment….Television was therapy for me those LONG 6 months. In 2009 a television show came on the scene that changed what we expected from a series and introduced a nation to what a select few of us already knew was fabulous: show choir/swing choir/glee club. Aside from numbers being perfectly executed in a week’s time, some of what “Glee” showed was remarkably true. Social standings from the hallway never mattered in the choir room. The choir room was a refuge. 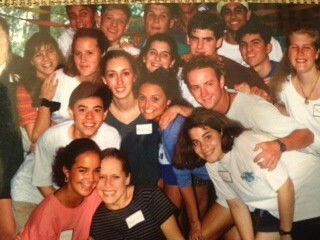 I passionately loved high school and did not want to leave, but like all teens, there were tough times. I forgot the words to the National Anthem in front of the entire school. My choir friends consoled me. A girl in my grade did not like me for a month. My choir friends wrapped me in their friendships. A breakup was never that awful while practicing your favorite songs for an upcoming competition. 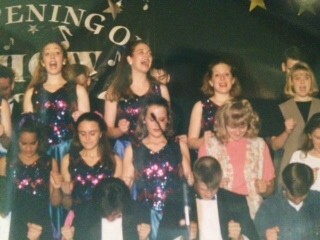 I participated in many things during high school, but show choir was my very favorite. 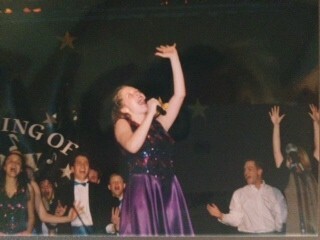 “Glee” made show choir cool and exposed what some of us have loved for years to many generations at one time. It brings all genres of music to us weekly, and makes school fun. My heart broke today when I read that Cory Monteith died. I loved him on “Glee.” Through his character, I recognized different boys I knew from my own days. He had such a sweetness to him. Because everything now revolves around my child, I mourn for his mother and wonder if she is thinking about her child as a baby. My own mother wondered if it would impact teenagers to stay away from drugs. I think not, but I think it can inspire us as parents to work harder, to be more present, to be enough. I heard that somewhere, to be enough, and it stuck with me. Please let me be enough of a disciplinarian to keep him safe. Please let me inspire him enough to help him find his own passion. Please let me show him enough of my love so he always knows his self- worth. At the end of the school year, there was a song that was always sung and it was really in honor of the members who were graduating. It has been running through my mind as I think of the artist lost. It wasn’t a good bye as much as it was passing on to another phase of life. Rest in Peace Cory and let the river run. It’s asking for the taking. In the eyes of your lover.